This smart weatherproof box from Dri-Box is ideal for keeping your cables and connections nice and dry. Made from black plastic and IP55 rated, the box has a silicone seal and locking lugs. Easy to use and lightweight, with a locking clamp so no screwdriver needed. 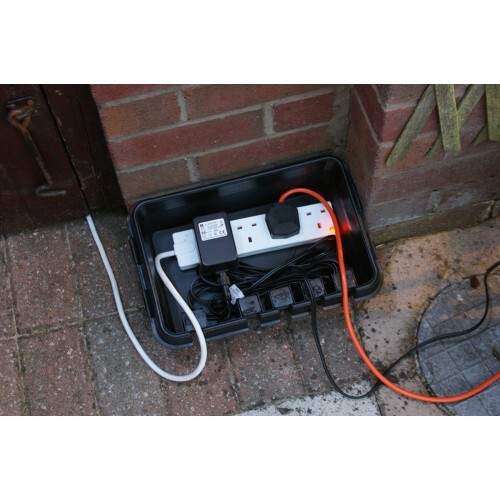 This medium box contains 4 output holes for multiple connections, and measures 285mm x 150mm x 110mm. Perfect for a couple of different connections. We also sell a smaller (200mm) version. This smart weatherproof box from Dri-Box is ideal for keeping your cables and connections nice and d..